The new football season is upon us, and another year brings with it another iterative release of Konami's foot-to-ball franchise, as PES returns for its 2018 season. PES 2018 is a conservative entry in the series, parking the bus on the football series by playing it safe. 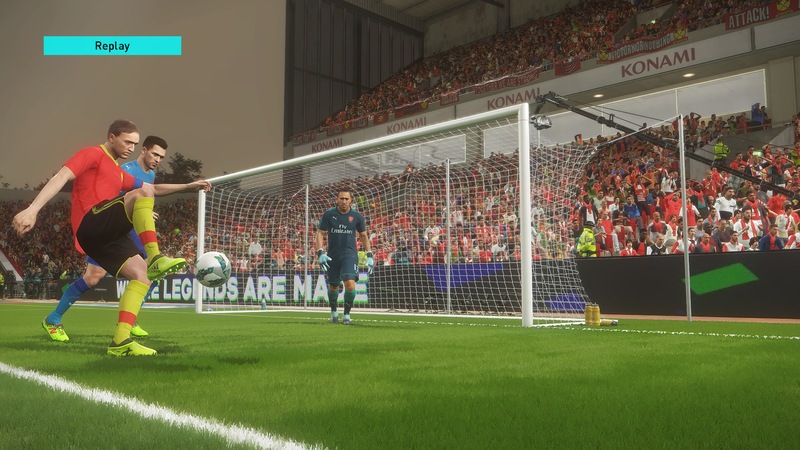 However, while it only takes small steps forward, they're confident ones, and it reaffirms PES' role as the best game to actually play football. While in the old days we'd see many different football games released every year, now the competition is down to just FIFA and PES each season, and it's impossible to talk about one without mentioning the other. In short, FIFA has all of the mod-cons: the kits, the Mass-Effect inspired story, that mode where you spend lots of real life money to buy digital playing cards to build a team to play football with. PES? PES is the best version of the beautiful (digital) game, and 2018's entry looks set to maintain that record, with a variety of systems coming together to make this the best game of football you can have with a controller in your hand. 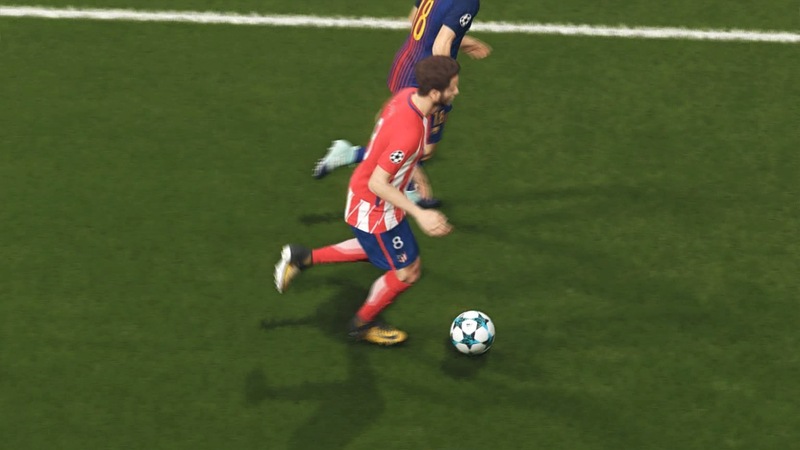 The real winner here is the game's Real Touch+, an improved-upon version of the Real Touch system in PES 2017, which means that players move like you would expect when they're playing the ball. Players will use every part of their body - head, shoulders, knees, and toes - as they try to control the ball, and while dribbling it down the field you can see their weight shift noticeably as they charge down the pitch at full throttle. This works on two levels, mechanically giving you a greater chance of landing a pass between two players, but visually offering up a whole new range of flicks, nudges, and taps that can add a bit more drama to each match. This is helped by PES's commitment to making every player feel unique. 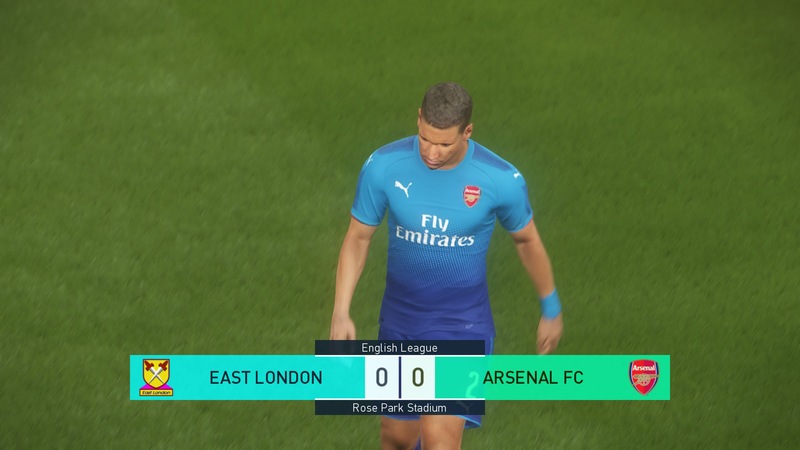 I reviewed both PES 2016 and PES 2017, along the way putting in the hours using East London (West Ham) in the Master League, building a team. I'd gotten used to how the team worked, but this year, sterling midfielder Alex Song has moved on, and that's reflected in PES. Suddenly, without that dominant and speedy presence in the midfield, West Ham feel like a totally different animal on the pitch. I've never felt Alex Song's absence more strongly than when I tried to floor the ball with Noble and found myself dispossessed and completely out of luck. 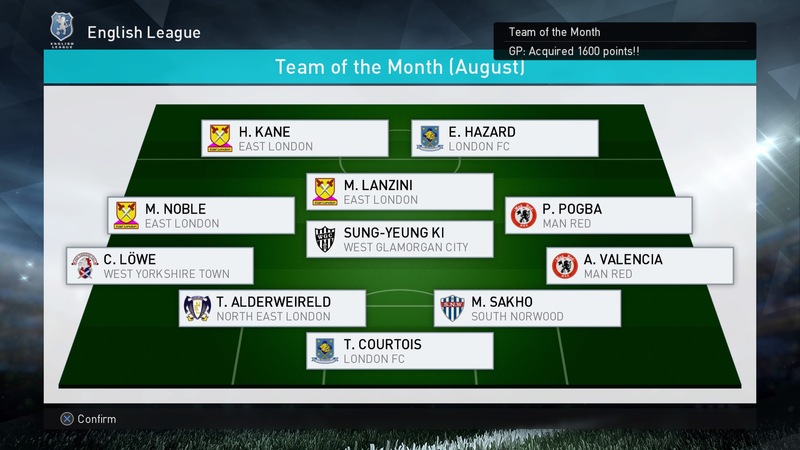 Similarly, when I decided that Andy Carroll didn't work for me as a striker, I replaced him with Harry Kane, a better striker in real life, and PES moved in a different way, with Kane's trademark burst of speed allowing him to nip in and out. Building your own team is one of the highlights of the offline game, with the Master League allowing you to pull together a team and even turn my beloved West Ham into a world-beating side, despite real-world wobbles in form. 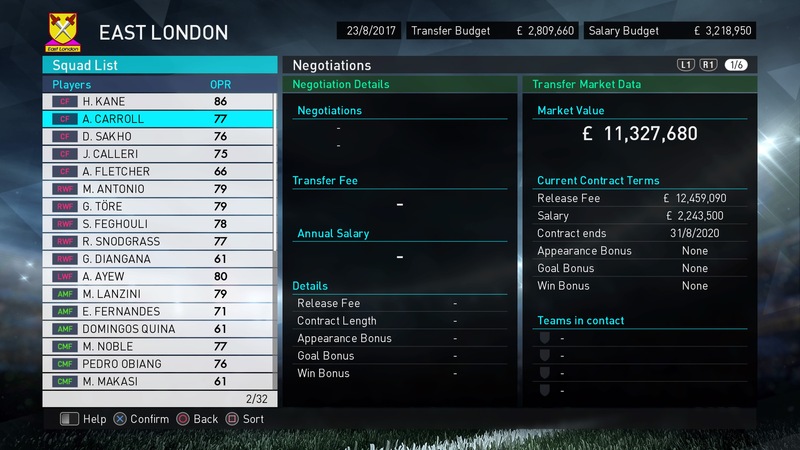 In the Master League's Classic mode, you can sign who you want, play who you want. You'll have very few issues as long as you've got the money. The new Challenge mode makes things a little tougher, requiring you to juggle lots of backroom issues and keep egos happy. PES 2016 and PES 2017 set a high benchmark for the beautiful game, and PES 2018 builds on the foundations laid by those games to reaffirm itself as the best way to do the digital football. If you've played either of these predecessors, you'll already know what PES does right: The football itself is phenomenal, and the way the game portrays the movement of the ball and the unique characteristics of each player makes it a must buy. However, it still hasn't taken care of some of its biggest issues. Off the pitch, the UI and user experience of playing the game is poor, with information often difficult to find in various submenus. The soundtrack is passable, although lacks any real gems. On the pitch, audio design feels sub-par, with some goals being whacked in without so much of a whimper from the crowds, while occasionally the smallest tap will be met by Peter Drury screaming your players name like you've just driven his brand new Ferrari into a lake. I don't think Drury owns a Ferrari, and it's really not his fault, but the commentary is particularly grating. Football game commentary is always bad, a victim perhaps of developers only being able to record so many different variations on common occurrences, meaning it's not long until you start regularly hearing the commentators chatting about your attempts on goal or star players you've signed. It's a bold move, perhaps, but I can't help but feel like a developer needs to draw a line and cut commentary from their game, so we can all just stop pretending like we care about it. Finally, the kits for the unlicensed teams are terrible, making these professional footballers look like they're playing in a Sunday league team. Many teams are licensed with PES now, but for those still wearing names like South Norwood (Crystal Palace), Hampshire Red (Southampton), and West Glamorgan City (Swansea), kits are devoid of any detail and it makes the team feel a little low rent. These are all minor issues, but they roll together to make the game feel like it's lacking in polish, making PES feel in terms of presentation like a budget game. Still, PES is a AAA game, and it shows every single time you kick the ball. For yet another year, PES nails the football and fudges everything else. It's an almost frustrating cycle, but one that we'll almost certainly see repeated in 12 months when PES 2019 emerges. Still, get past the sense of déjà vu, and it's hard to fault it.